Progress continues to be made in the analysis of forages and in determining how they ferment and digest in a dairy cow. The impetus for this advanced research is driven by the expanding interest in utilizing more forages in milk cow diets as grains and commodity by-products become more expensive and supplies less dependable. A fundamental characteristic — and therefore a challenge — of forages is that they are highly variable both physically and chemically. This results in the uncertainty of their quality and the unpredictability of the digestible nutrients they deliver. The term “fiber” is used as a general description for the indigestible or slowly digestible parts of feedstuffs. Fiber — especially forage fiber — affects feed intakes, passage rates, rumen fill and nutrient absorption. The analysis of forages, the application of the results and the prediction of milk production has been an ongoing evolution. In the earliest days of balancing dairy cow diets, the inverse relationship between protein and fiber was used as a means to measure forage quality. In the 1960s, tests were developed to measure the different fractions of forage fiber that distinguished between lignin and other types of cellulose. For many years the lignin level in a forage was used as a proxy to predict fiber indigestibility and energy values. The test for NDF — neutral detergent fiber — is currently considered the best test for measuring insoluble fiber and predicting rates of passage for feedstuffs. Forages such as grasses and legumes have high percentages of NDF compared to grains, which are low in NDF and commodity by-products such as soyhulls, beet pulp or cottonseed, which have intermediate levels of NDF. Most of the studies and research directed toward NDF digestibility is focused on forages. Milk production is highly correlated to the amount of feed dry matter a cow can consume each day. Dry matter intakes (DMI) are very dependent upon feed digestibility and rumen fill. The challenge faced by dairy scientists and nutritionist in establishing the energy value and potential milk production coming from forages is predicting how quickly (the passage rate) forages move through the rumen. A concept that is gaining acceptance among dairy scientists is that there are at least three pools of fiber digestion — a rapidly digestible pool, a slowly digestible pool and an indigestible pool that is excreted by the cow. 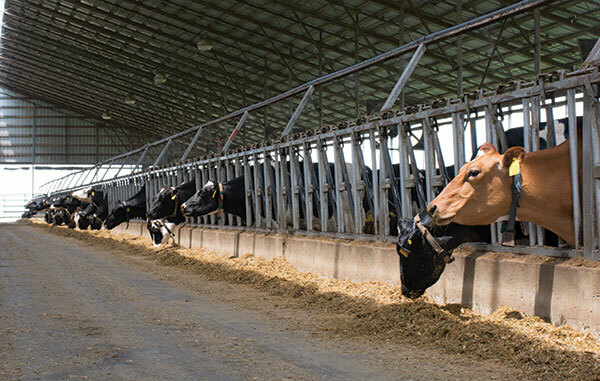 These forage fiber pools vary from forage to forage and the differences will have a profound impact on forage intakes, forage fermentation and ultimately how much milk a cow produces. Especially for dairy farms that strive to feed high percentages of forage to their cows — at over 60 percent of dry matter, even small changes in forage digestibility will affect milk production due to the impact on both gut fill, passage rate and rates of fermentation. Older research established the maximum level of forage NDF intake for dairy cows at about 1.2 percent of a cow’s body weight. However, it has been found that in some feeding situations, cows can consume forage NDF at higher levels. What has been suspected is that NDF in various forages have differing rates of digestibility and passage. Each of the common forages — corn silage, grasses or legumes — can have markedly different pools of fiber digestion. When rates of fiber digestibility are higher, more feed can be consumed. Forage testing laboratories have been analyzing for different rates of NDF digestibility — 24-hour, 30-hour and 48-hour — estimating the amount of NDF that would be digested prior to passing from the rumen. Knowing these values enables the ruminant scientist to estimate the rumen retention of forage, gut fill and how much VFA — volatile fatty acids — will be produced, allowing for an estimation of energy metabolism and milk production. In addition to the 24-, 30- and 48-hour NDF digestibility, labs have also developed a 120- and 240-hour NDF digestibility that essentially measures the slow and indigestible pools. Digestion trials for corn silage, legume haylage and grass haylage all indicate that over half of the NDF is digested by 30 hours after the cow consumes her feed. Diminishing amounts of NDF disappear by 120 hours — this being the slower NDF pool — with a continuing amount of digestion after 120 hours. This new information has altered the earlier belief that much of the forage NDF is indigestible. Data collected from Dairy One Forage Testing Lab (Ithaca, N.Y.) shows the significant difference of NDF digestibility (NDFD) for the three forage groups (see table). Corn silage, overall, has the highest average NDFD at almost 80 percent. Total average NDFD for grass haylage is over 73 percent, while total average NDFD for legume haylage was the lowest at just below 60 percent. It’s noteworthy that the greatest nutrient yield coming from the legume haylage occurs during the first 30 hours and then slows significantly. This would suggest that VFA is produced more quickly from a legume forage but then significantly slows down. The digestible NDF coming from corn silage and grass, while similar for the 30-hour pool, continue to digest more of their total NDF after 30 hours, possibly maintaining continued VFA production. The differing rates of NDF digestibility for these three forage groups will impact the amount of rumen forage fill and fermentation at any given time. As suggested earlier, there are also large variations from the high to the low for the NDFD within each of the forage groups. For all of the samplings within the forage groups, there were samples with 240-hour NDFD of over 90 percent but as low as 37 percent (not shown in table). This makes the need for regular NDFD testing at different time points as well as sampling all cuttings and forage species imperative to the accurate balancing of milk cow diets. For forage growers and dairy farmers, understanding the variability of fiber digestibility in forages is becoming more critical when balancing rations, particularly for high-producing herds. Especially with hay crop forages, NDF digestibility will change from cutting to cutting and field to field throughout the course of a growing season. To test just one cutting for digestibility and assume that a diet will be in balance all year long based on that number is a mistake. NDFD for corn silage will vary based on hybrid and from field to field based on growing conditions, as well. The cows will always tell you if a forage is going to milk or not. But in these days of unpredictable milk prices, knowing ahead of time the digestibility characteristics of forages will prevent any unwanted surprises that will negatively impact the dairy’s milk revenue. This article appeared in the February 2016 issue of Hay & Forage Grower on pages 40 and 41.